In 2008, the trend of reducing annual quantities of deposited waste continued both in landfills that are part of public infrastructure as well in landfills operated by the industry. In 2008, 835.3 thousand tonnes of waste were deposited on landfills belonging to public infrastructure and 207.8 thousand tonnes were deposited on landfills operated by industry. This indicator shows the quantity and structure of waste deposited at legally operating landfills in Slovenia. It outlines the quantity and structure of non-hazardous municipal waste deposited in public infrastructure landfills as well as the quantity and structure of waste deposited in industry-operated landfills. According to the Environment Protection Act, waste is defined as any substance or item which is discarded, going to be discarded or must be discarded by its owner, producer or any other person in possession of the substance or item. Each type of waste is defined by a six-digit classification number, i.e. a code from the classification catalogue. The waste classification catalogue is published as Annex No. 7 to the Decree on waste management (Official Gazette of the Republic of Slovenia, No. 34/08). Hazardous waste that is marked with an asterisk next to the classification number has one or more hazardous characteristics defined in the framework regulation on waste management. According to the legislation, non-hazardous waste is defined as any waste that has not been classified as hazardous waste. Inert waste, as defined by the regulation on the landfilling of waste; however, is defined as any waste that will not undergo significant physical, chemical or biological modifications, will not decompose, is not flammable, biodegradable or otherwise chemically or physically reactive, does not present a health risk and does not affect other substances if it comes in contact with them in such a manner that may increase the burden on the environment. Landfilling, i.e. the process of waste disposal, is appropriate as the final treatment of waste that cannot be recovered or otherwise utilized. Various types of waste shall be deposited in appropriate landfills. In compliance with the regulation on landfilling of waste, landfill types are defined as: hazardous waste landfills, non-hazardous waste landfills and inert waste landfills. A landfill is defined as a site of one or several facilities for the disposal of waste onto or into the ground (i.e. underground). A landfill is also deemed to be any facility or site, or part thereof, used by the producer of waste for the storage of waste at the place of production for more than three years before depositing the waste for further recovery in compliance with the relevant waste management regulations. A landfill may further be any facility or site, or part thereof, used for temporary storage of waste for more than a year before depositing the waste for further disposal in compliance with the relevant waste management regulations. Municipal waste, i.e. mechanically and biologically treated municipal waste, non-hazardous waste and processed non-hazardous waste with high content of biodegradable substances, as well as stable and non-reactive hazardous waste with pollution parameters not exceeding the pollution limits specified for each type of waste in the waste landfilling regulation, may be deposited in landfills for non-hazardous waste. Landfills for hazardous waste and for inert waste may only be used for deposition of waste not exceeding the parameter limits specified in the regulation on landfilling of hazardous and inert waste, respectively. Landfilling of municipal waste, i.e. waste from households and other waste of similar origin and composition, falls within the competence of municipal public utility services and is permitted in non-hazardous waste landfills that are local public utility facilities and/or public infrastructure facilities. In addition to landfilling on local public utility facilities, non-municipal waste may also be deposited in landfills operated by legal entities or sole proprietors. These operators are responsible for active or inactive landfills or underground storage sites that they manage in compliance with regulations. · Reduction of deposited quantities of waste, especially biodegradable waste. The official records of the Environmental Agency of the Republic of Slovenia show that there were 83 landfills recorded in Slovenia by the end of 2007, some of them active and some closed or in the process of closing. Out of the 83 recorded landfills, 60 were public infrastructure landfills and 23 were industrial waste landfills. Of the total number of public infrastructure landfills, 24 are in the process of being closed pursuant to waste landfilling legislation. By the end of 2008, 28 public infrastructure landfills were in the stage of adapting to the technical requirements stipulated in the regulation on landfilling of waste. The remaining 8 landfills have landfill cells constructed in accordance with the requirements of the landfilling legislation. According to the Environmental Agency of the Republic of Slovenia, waste was landfilled at 40 public infrastructure landfills in 2008 (included in the programme of adaptation, deposition in new landfills and within the framework of the uncompleted works plan). At the remaining landfills, no waste was deposited and only deactivation works were carried out. According to the comparison of data on the quantities of waste deposited on public infrastructure landfills, which was carried out by the Environmental Agency of the Republic of Slovenia, the quantity of waste in 2002 was reduced by approximately 14% compared to 2000 (from about 956 thousand tonnes to about 822 thousand tonnes). The data have been registered as part of the waste disposal taxation procedures for the landfilling of waste. In the period from 2002 up to and including 2007, between 810 and 845 thousand tonnes of waste were landfilled per year. Slight fluctuations were detected in the period between 2002 and 2004; in 2003, the quantity increased by approximately 2.7% compared to quantities deposited in 2002, while in 2004 quantities decreased by approximately 1.4% compared to 2002. Comparison of data for 2005, however, reveals a 15% reduction of the total mass of landfilled waste relative to the base year 2000. Figure OD2-1 1 reveals that 2006 again witnessed a rising trend in the quantity of waste deposited in public infrastructure landfills, marking a 4.2% increase in deposited waste compared to 2005, i.e. 844.5 thousand tonnes of waste, which is approximately equal to the quantity of waste deposited in 2003. In 2007, the situation regarding the quantity of deposited waste remained almost equal to 2006; the quantity of waste deposited was only 0.3% below the 2006 value, with 841.7 thousand tonnes of waste deposited in public infrastructure landfills. The trend of such minimal decreases in annual quantities of waste deposited in public infrastructure landfills continued in 2008. In comparison to the preceding year, i.e. the year 2007, only 0.8% less waste was deposited in 2008, when 835.3 thousand tonnes of municipal and non-municipal waste were landfilled. Compared to the base year 2000, when this indicator was first introduced, the annual quantity of waste deposited on public infrastructure landfills was reduced by only 13% in 2008. According to the Statistical Office of the Republic of Slovenia, a rising trend in the quantity of generated municipal waste from the preceding period continued in 2008. The quantity of generated municipal waste in 2007 increased by 2.3% relative to 2006, and then again by 4.2% in 2008 relative to 2007. A similar increase was registered in the generation of hazardous municipal waste, i.e. by 4.0% compared to 2007. In 2008, only 0.1% more municipal and similar waste was collected by public utility services compared to 2007. This resulted in a minimum difference in the quantity of waste deposited in public infrastructure landfills in 2008 as compared to 2007. According to the Environmental Agency of the Republic of Slovenia, a total of 835.3 thousand tonnes of waste was deposited in public infrastructure landfills in 2008, of which 84.8% constituted municipal and similar waste, while 15.2% was non-municipal waste. The majority of deposited non-municipal waste consisted of non-hazardous waste (82%), while the remaining (18%) was inert waste. According to the Statistical Office of the Republic of Slovenia, 822.7 thousand tonnes of waste were deposited in landfills in 2008. Differences in the quantities of deposited waste result from the possibility of different interpretations of data used for the cover layers of the landfill body. In some cases, this quantity is stated as deposited waste; hence, the data stated by the Environmental Agency of the Republic of Slovenia indicate larger quantities of deposited waste in 2008. According to the Statistical Office of the Republic of Slovenia, the average structure of waste deposited in public infrastructure landfills in 2008 was as follows: 79.2% municipal waste, 9.4% construction waste, 3.8% sludge from wastewater treatment, 0.1% packaging waste, 0.7% waste from wood and paper processing and 6.7% other waste. According to the Statistical Office of the Republic of Slovenia, the structure of waste deposited on public infrastructure landfills has not significantly changed in comparison to previous years. 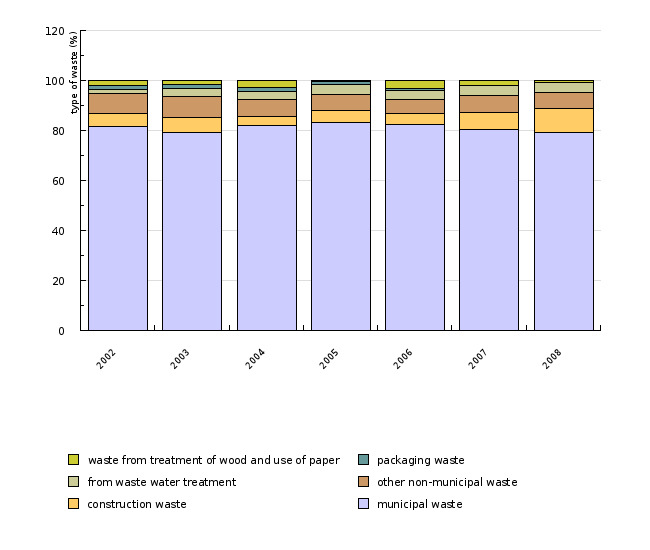 Municipal waste, which makes up the majority of all waste deposited, was slightly reduced in relation to 2007 (80.5% in 2007), while the quantities of other above-stated types of deposited waste remained in the range of the 2002-2007 period, with the exception of packaging waste and construction waste. In 2008, the trend of reduction in the quantities of deposited packaging waste continued; in the period from 2002 up to and including 2005, packaging waste accounted for 1.9% of total deposited waste, on average, decreasing in 2006 to just 0.6%; in 2007, packaging waste constituted only 0.2%, and in 2008 only 0.1% of total deposited waste. The share of deposited construction waste increased by 6.8% in 2008 in relation to 2007 (in 2008, construction waste accounted for 9.4% of the total deposited quantity of waste). A rising trend in deposited quantities of this type of waste has been registered since 2006. It was assumed that the percentage of the deposited residue of municipal waste in the total quantity of waste deposited in landfills after 2007 would increase due to a higher degree of pre-treatment of waste prior to its deposition, in order to extract the reusable fractions of waste beforehand. The residue following the recovery is classified as mixed municipal waste and is disposed of in compliance with procedure D1 (landfilling). It may thus be assumed that in the upcoming years, the share of mixed municipal waste deposited in landfills will continue to increase relative to the total quantity of deposited waste, while the total quantity of deposited waste will continue to decrease from year to year. Such assumption was confirmed by the lower quantity of deposited waste in 2008 both relative to 2007 and relative to 2006. Based on the data on environmental protection taxes, there were 15 active industry-operated landfills in 2000. By the end of 2006, the number had risen to 19, though waste landfilling did not take place at two of these in 2006. All 19 landfills were still in operation in 2007, although no waste was landfilled in two of them in that year. In 2008, the number of registered operating landfills fell to 17, but waste was actually deposited at only 14 landfills in 2008. Deactivation works were carried out in some other landfills, while some of them were closed or received no landfill waste at all due to production processes. After 2000, when, according to official records, only 145 thousand tonnes of waste were deposited in industry-operated landfills, the quantity of recorded deposited waste increased by more than 100% in 2002 (295.4 thousand tonnes). After 2003, a falling trend in the quantity of deposited waste was registered up to and including 2005 (210.6 thousand tonnes of deposited waste). In 2006, the quantity of deposited industrial waste increased once again – with 297 thousand tonnes of industry-generated waste deposited, which exceeded the value from 2003. In 2007, less waste was deposited, i.e. about 252 thousand tonnes. As a consequence of the above-mentioned reduction in the number of landfills, a smaller quantity of industrial waste was landfilled in 2008, i.e. only 207.8 thousand tonnes. In terms of the type of waste, these landfills accept inert, non-hazardous and hazardous waste. The annual quantity of deposited hazardous waste amounted to approximately 2–4.5% of the total quantity of landfilled waste over the period concerned, with 3.0% recorded in 2008. Over 50% (up to a maximum of approx. 70% in 2003) of all landfilled waste from manufacturing activities was inert waste until 2007. In 2007 and 2008, inert waste only amounted to about one third of total deposited waste. While the quantities of deposited non-hazardous waste varied between 27 and 52% of the total annual quantity of deposited waste until the end of 2007, about two thirds of non-hazardous waste were deposited in these landfills after 2007. In 2008, the proportions of deposited waste were as follows: 36.3% inert waste, 60.7% non-hazardous waste and 3.0% hazardous waste. Objectives summarized by: Environment Protection Act (Official Gazette of the Republic of Slovenia, No. 39/06, as amended) and from the Operational Programme on waste deposition aiming at the reduction of deposited quantities of biodegradable waste for the 2009-2010 period. Data administrator: Environmental Agency of the Republic of Slovenia, contact person - Marija Ulrich Supovec. Statistical Office of the Republic of Slovenia, contact person, Mojca Žitnik. Methodology and frequency of data collection for the indicator: The Ministry of the Environment and Spatial Planning – Environmental Agency of the Republic of Slovenia, has been monitoring the quantity of deposited waste since 2001. Landfill operators first reported on the quantity of landfilled waste for the year 2000. Data have been collected on the basis of the Decree on the waste disposal tax (Official Gazette of the Republic of Slovenia, Nos. 70/01, 09/04) and/or on the basis of the Decree on environmental tax for environmental pollution caused by waste disposal (Official Gazette of the Republic of Slovenia, Nos. 129/04, 68/05, 26/06, 132/06 ,71/07 and 85/08), and on the basis of Decree on the landfill of waste (Official Gazette of the Republic of Slovenia, Nos. 32/06, 98/07, 62/08 and 53/09). The Decree on environmental tax provides that landfill operators liable for payment of waste disposal or environmental tax are obliged no later than by 31 March of the current year to submit data on types and quantities of waste deposited in the past calendar year on the prescribed form. The form is attached to the Rules on the form and content of tax return for the waste disposal tax, published in the Official Gazette of the Republic of Slovenia, No. 05/03. Data submitted by individual taxpayers are gathered on the basis of the records they are obliged to keep in accordance with the regulation on waste management or the regulation on the landfill of waste, respectively. These data are then entered into the Waste Management database. Data are available for the period 2000-2008. The Statistical Office of the Republic of Slovenia acquires data on public collection and removal of municipal waste, the origin and further treatment of the collected quantities of waste by statistical research of annual reports on collected municipal waste (Form KO-Z). By statistical research of annual reports on quantities of waste brought to landfills (Form KO-U), they collect data on number and location of public landfills and capacity. 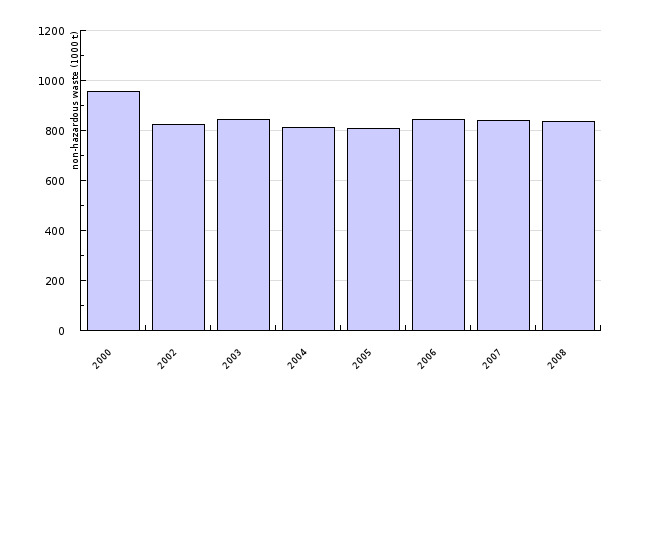 Data are available for the period 2000-2008. Until 2005 were data recorded only for the landfills, which are public infrastructure (municipal landfill sites). The Statistical Office of the Republic of Slovenia updates the data on public removal and landfill of waste, every year at the end of September, while the data on waste brought to landfills including their origin, recovery and disposal are updated every year at the end of May. 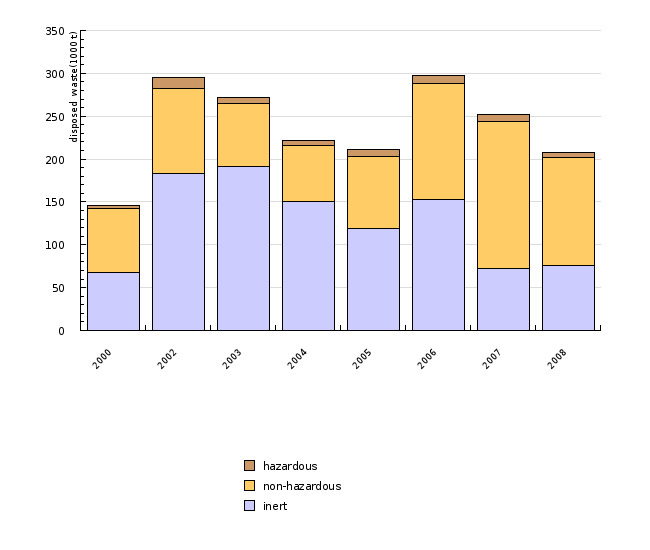 Data processing methodology: Figure OD2-1 shows the quantity of non-hazardous waste deposited on public infrastructure landfills in 000 tonnes. Figure OD2-2 illustrates the shares and structure of waste deposited on public infrastructure. Figure OD2-3 presents the quantity and structure of waste on industry operated landfills in 000 tonnes. - Advantages and disadvantages of the indicator: Advantage: data are internationally comparable. Disadvantage: Minor deviations in the values of annual quantities of deposited waste presented by EARS and SORS due to different interpretation.